We are an unparalleled name in offering a wide gamut of Chemical Mixer. These mixer agitators are developed in accordance with the set industry standards & finest quality of components. 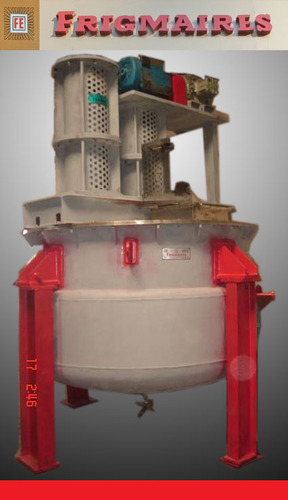 Offered mixer agitators find application in mixing of viscous liquid and powder like of dyestuff, shampoo & many more. Our quality experts inspect these mixer agitators on number of parameters in order to make certain its flawlessness. Frigmaires incorporated in 1961, is a partnership firm manufacturing process plants and machinery required by Resin, Paint, Grease, Lube Oil, Bitumen Emulsion, Dry Mix Mortar, Soap, Mixers and other similar industries. Over the years as the country was aiming towards self reliance and industrialization, our firm jointly with our clients took up the challenge in finding solutions and developing cost effective equipments & process for meeting their stringent demands. Along with the growth of our clients grew our reputation, experience and knowledge of the manufacturing process and technologies. We wish to pass on to industrialists & entrepreneurs desirous of setting up new industries, expanding or diversifying, their present range of activity. Our manufacturing facilities are equipped with sufficient machinery and fabrication equipment. Over 90% of our jobs are carried out in house with a team of skilled work force and qualified engineers. Each stage of manufacture is closely inspected for quality and workmanship.